Byproducts of his Masters victory in 2013 have been plentiful, but not lost on Adam Scott is an annual ritual that he feels privileged to be part of. The Champions Dinner? Well, sure, that’s a given. But the first Australian to win the Masters is at Augusta National for a fifth time as a former champion, and for a fifth time he put his hand up – and his Green Jacket on – to be a presenter at the Drive, Chip and Putt National Finals. “What’s not to like about kids out there playing golf? A lot of good has come from this so far. I think it’s been effective,” said Scott, who was beneath the sprawling oak tree behind the Augusta National Clubhouse to meet, greet and celebrate with the competitors in the Girls 14-15 division. The overall winner, Katherine Schuster of Kill Devil Hills, N.C., was especially thrilled to be handed her trophy by Scott, as they now have something in common. Schuster, despite conceding she thought she misread the line, made one of two putts (the 30-footer on the upper tier) on Augusta National’s famed 18th green and talked of watching a video from 2013, the year Scott made a 15-foot birdie putt on 18, then beat Angel Cabrera in a playoff. Katherine Schuster of the Girls 14-15 division, reacts to her chip shot attempt at the Tournament Practice Facility during the Drive, Chip and Putt National Finals at Augusta National Golf Club. That the Drive, Chip and Putt National Finals debuted in 2014, Scott’s first year as defending champion, is pure coincidence, of course. Scott will take no credit for this national competition that has been widely hailed and begins with 200 local qualifiers. But he embraces the chance to be part of the ceremony, as do other former champions. This year, Nick Faldo followed Scott to the ceremony area, then came an impressive parade of presenters: Bubba Watson, Sergio Garcia, Gary Player, Mark O’Meara, Trevor Immelman and Ben Crenshaw. In addition to his presentation duties, the defending champion Garcia was a special guest Saturday evening during a reception dinner for Drive, Chip and Putt competitors, taking the opportunity to help Schuster and others with their fist pumps. Scott said he stood at the back of the Tournament Practice Facility and watched a series of young kids “all swinging on plane,” an indelible image that earned a nod of approval. “Whether they’re taught that or not doesn’t matter; it’s impressive,” he said. 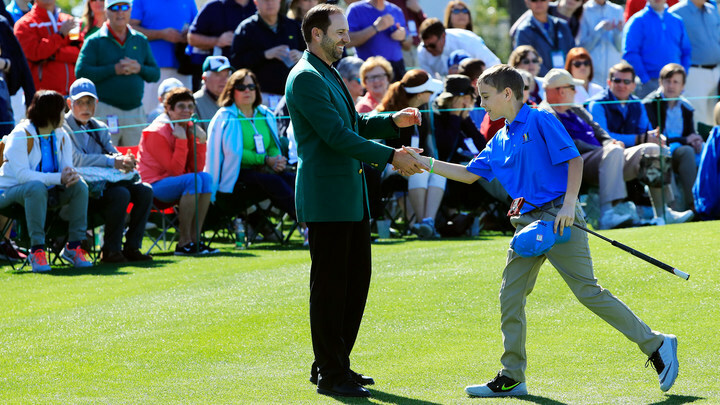 Defending Masters champion Sergio Garcia greets Wyatt Nickson as he completes the putting portion of the Drive, Chip and Putt National Finals. 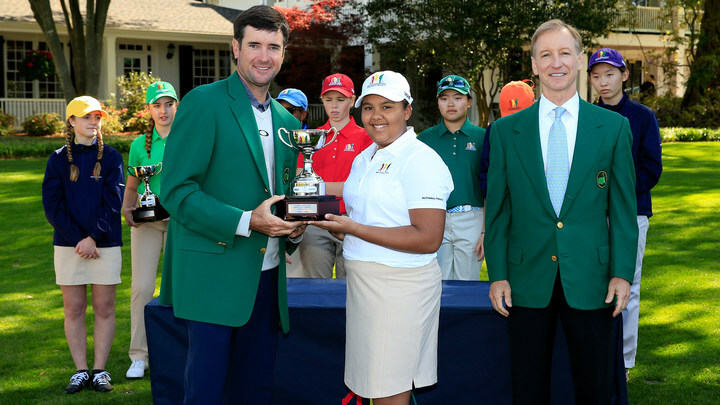 Masters champion Bubba Watson presents the third-place trophy to Girls 12-13 divsion champion Kasey Maralack. 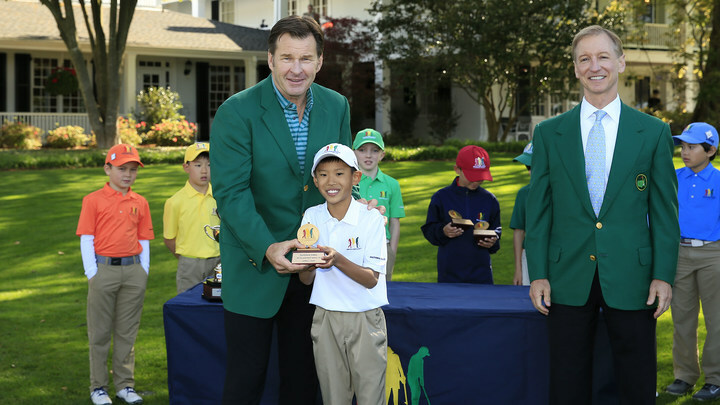 Masters champion Nick Faldo presents the first-place Putt trophy to Boys 7-9 division champion Taighan Chea. As he mingled beneath the oak tree, Scott stopped and chatted with Faldo, then Watson popped into their little circle. Soon, O’Meara wandered out of the Clubhouse, surveyed the scene, and said he, like Scott, looks forward to this latest addition to the annual traditions that make the Masters an unforgettable week. Told that Schuster mentioned Scott’s 2013 putt as a memorable putt on Augusta’s 18th hole, O’Meara laughed. He understood, too, because his Masters-winning putt on the 72nd hole came 20 years ago, before Schuster was even born. The key thing is, O’Meara remembers it; in fact, it invoked one of those wonderful memories that magically unfold beneath the oak tree. “It’s funny, but I’ll always remember that Freddie (Couples) was in the bunker (at 8-under), and as he got ready to play, I fully expected him to hole it (for birdie), so I figured my putt was just to get in a playoff,” O’Meara said. Of course, it’s part of Augusta National’s storied history – Couples didn’t hole-out for birdie, so when O’Meara converted his 18-footer to finish at 9-under, it won him the Masters in his 15th start. Thus, his annual invitation to be part of the Masters, a trip that again included his participation in the Drive, Chip and Putt National Finals. Like Scott, O’Meara said he believes in this initiative, so he was willing to do more than put on his Green Jacket; he put up his hand to be part of it. Again.